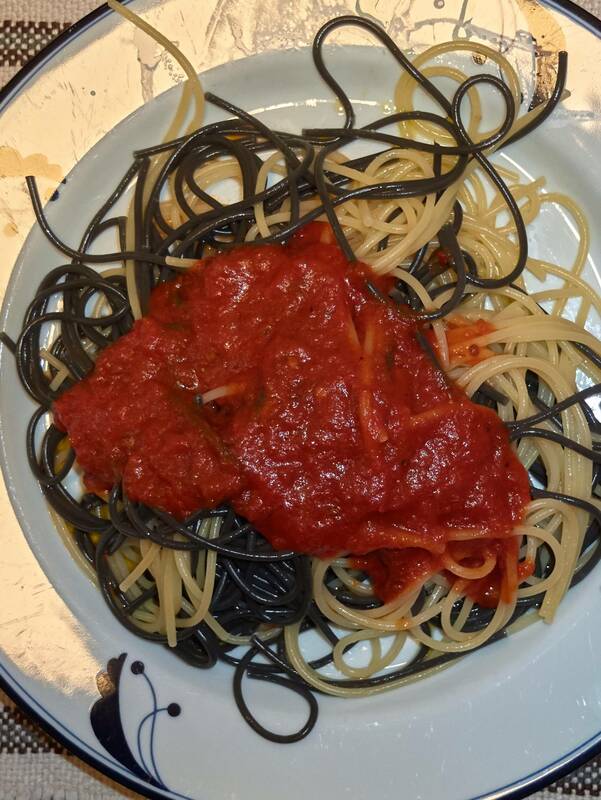 We were gifted a pound of squid-ink spaghetti (secco), which we politely thanked our benefactor for. Truth be known, yr obdnt srvnt is an obnoxious pasta snob, and the spaghetti that we purchase for ourselves comes from one of two producers in Le Marche province of Italy, where “no transport” pasta secco is produced: the durum wheat is grown by organic farming, and is harvested at a closely monitored time, and taken from the field to a factory located in the midst of the field, where it is ground into flour, combined with local pure water, extruded through bronze dies, slow-dried in the ambient air, and packaged on the same premises. We could not dishonor our friend's generosity by failing to eat the squid-ink pasta bestowed upon us, but our needs the day that we cooked it required us to consume only about 2/3 of the bounty, so we had about a third of a pound left over, insufficient by itself to constitute a full serving for the two of us. So this evening we cooked up a batch of intertwined squid-ink spaghetti and Montebello Le Marche spaghetti in a single pot, using the Agnesi cooking method of bringing the salted boiling water back up to a rolling boil after immersing the dry pasta, and immediately (1) sealing the pot with a clean cotton towel acting as a gasket between the pot and a tight fitting lid, and (2) turning OFF the heat source under the pot as soon as the top has been fitted. We drain and serve and consume the spaghetti immediately after the needed cooking time in the cooling-down water has been reached, using a couple of tablespoons of extra virgin olive oil and a dollop of commercial Mezzetta Napa Valley Marinara sauce as the only condimento. Anxious to get to the raison d'etre of the exercise -- the eating -- this evening, I slopped the drained “zebra” pasta onto the plates and applied the (Moraiolo cultivar) EVOO and Mezzetta Marinara uncarefully. Admittedly, the presentation could have been better. But, if the proof is in the eating, then the experiment was an unqualified success. Thanks to you I now have a hankering for fresh squid ink pasta. I live in NJ and my goal for tomorrow is to scour the area looking for someplace that sells it so I can take it home and make it for my wife and son who have palettes that have tasted the finest NYC, California, Paris and London has to offer. And I can add Geneva and many other places to that list. If I can't find it made already, I'll try and find the Cuttlefish Ink and make my own. I've made my own pasta before. Darn enablers. Gotta love it! The pasta looks delicious. I have to see if I can't find a source for squid ink pasta up here. (04-12-2019, 08:42 PM)MntnMan62 Wrote: Thanks to you I now have a hankering for fresh squid ink pasta. Ours was prepared from pasta secco. Hint: Amazon ASIN B013J4QIZ4 (searchable that way at the site). Hey Mel! I have never heard of squid ink spaghetti! Thanks!